After making pumpkin pasties a few weeks ago, I was excited to try out some other flavors of pasties! It so happened that I had some strawberries that were teetering on the edge, so this was a perfect solution. I like that the pastry recipe uses cream cheese for moisture instead of ice water, so there aren't any worries about adding just the right amount. The pasties were a hit at the party I brought them to, and were both sweet and tart, with lots of strawberry flavor. Delicious! To make the filling, combine cornstarch and water in a small bowl. Whisk with a fork until smooth, and set aside. Puree fruit until smooth using a food processor or blender. In a large, heavy-bottomed saucepan, combine fruit puree, lemon juice, and sugar. Heat over medium-high until boiling, stirring constantly. Boil for 5-6 minutes until thick and syrupy. While stirring, slowly add cornstarch mixture and beat with a spoon (or whisk) until completely combined. Continue boiling for 2 more minutes until filling is about as thick as pudding; when you drag a wooden spoon across the bottom of the pan, you should be able to see the pan for a moment before the fruit mixture fills in the space. Remove from heat and cool completely. Place dry ingre­di­ents in medium bowl and mix together. Add the cold, diced but­ter and mix it together with flour until you have what looks like coarse bread crumbs. Add in the pieces of cream cheese and mix until the dough is very clumpy. Turn dough out onto a lightly flour dusted sur­face and knead until a smooth dough has formed. Wrap in plas­tic and chill for at least 30 min­utes. Can be made in advance and frozen up to 3 months. Preheat oven to 350. On a floured surface, roll out the dough to about 1/8-inch thick­ness and cut with round cookie or biscuit cutter. Place rounds onto a greased cookie sheet. Spoon a small amount of filling onto the bottom third of the dough circles. Fold the circles over and seal the edges by either folding over and pinching with your fingers, or crimping with a fork. 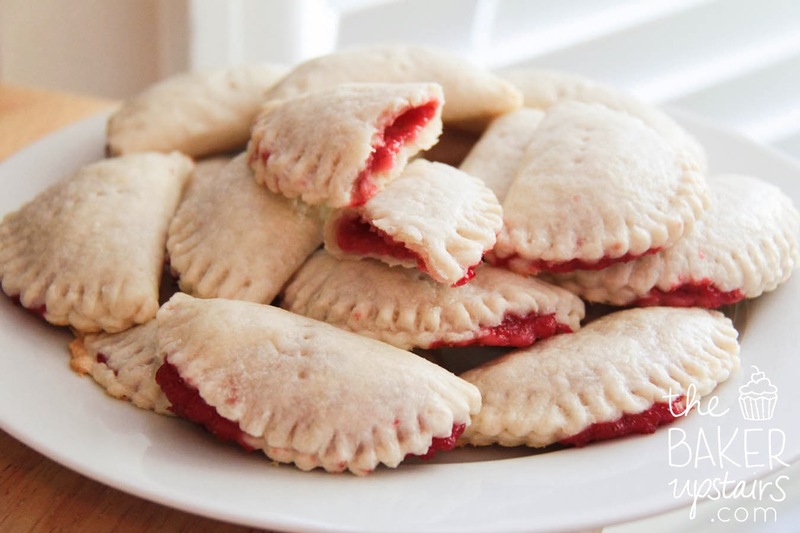 Using a pastry brush, lightly glaze each pasty with beaten egg mixed with a little milk or water. Bake for 25 minutes or until golden brown.